Three of the principal surface units attached to Combined Maritime Forces’ Combined Task Force 150 (CTF 150) have rendezvoused at sea, allowing them to conduct exercises and training to hone their skills as they continue to counter illicit activity in the northern Indian Ocean. CTF 150’s flagship, FS Somme, met up with the frigates FS Montcalm and HMCS Toronto and took full advantage of the opportunity to exchange information, replenish fuel and discuss their ongoing maritime security operations. 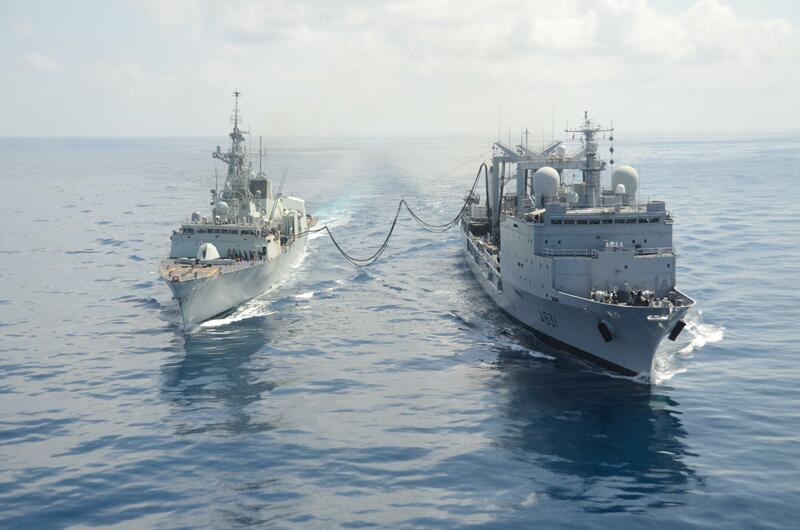 HMCS Toronto and FS Somme replenish at sea. Somme, who acts as an oiler and support platform for CTF 150 as well as being the Task Force’s command vessel, fuelled both frigates and exchanged personnel to gain experience operating with the other Task Force units. Toronto’s boarding team also took the opportunity to conduct boarding exercises on the Somme. The meeting at sea provided an ideal opportunity for Commander Jeff Hamilton, Commanding Officer of HMCS Toronto to invite Captain Jean-Michel Martinet, Commander of CTF 150 and Commander Yann Le Roux, Commanding Officer of FS Somme, on board to demonstrate the Canadian warship’s capabilities. Captain Martinet took advantage of this visit to address the Canadian crew. He congratulated them on a recent drugs seizure, and stressed the importance of CTF 150’s work in the region. “This visit provided me with an opportunity to extend my thanks to the crew of HMCS Toronto for the important support that she provides to maritime security operations in this region,” Captain Martinet said. Captain Martinet also added: “Building strong relationships with the regional maritime actors is paramount. These exchanges allow much closer cooperation within the Task Force, and greatly enhance the effectiveness of CTF 150 counter terrorism operations in the Indian Ocean.